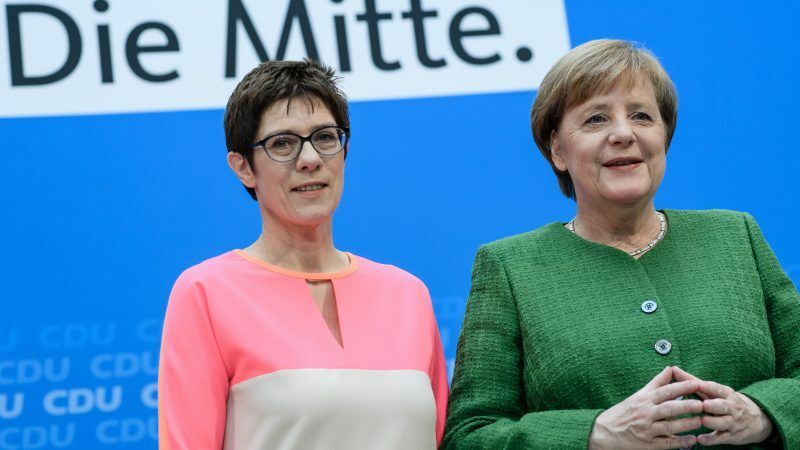 The decision to entrust Kramp-Karrenbauer, also known by her acronym AKK, with bolstering the CDU after it lost ground in an election last year, is significant as some party members are starting to look ahead to a post-Merkel era. Kramp-Karrenbauer, Saarland's state premier, to become Secretary General of Merkel's #CDU, according to media reports. The move positions her as a potential #Merkel successor in four years time. In another sign of the increased pressure the established parties are facing, the far-right Alternative for Germany (AfD) surpassed the centre-left Social Democrats (SPD) for the first time in a national poll to become the second-strongest party, an Insa survey for the daily Bild showed. Merkel’s conservative bloc gained 2.5 percentage points to reach 32 percent and the AfD was up 1 percentage point to 16 percent while the SPD fell 1 percentage point to 15.5 percent, the weekly poll showed on Monday. Insa researcher Hermann Binkert said Merkel’s Union of Christian-conservative parties was Germany’s last remaining “Volkspartei” or big popular party. “The promise to renew the party seems to work,” he added. Merkel, who was CDU secretary general before becoming chancellor, said Kramp-Karrenbauer, premier of the western state of Saarland, would bring “a lot of weight” to the role in what she called “difficult times, uncertain times”. The chancellor has been under pressure from within the CDU to bring fresh faces into senior positions and to begin planning for her own succession. By promoting Kramp-Karrenbauer she achieves both, and moves an ally into a key role. “We have known each other a long time and can rely on each other, even if we have our own views,” Merkel, 63, told a news conference with Kramp-Karrenbauer, 55. Though Merkel has said she is available as chancellor for four years, the succession debate has been supercharged by the inclusion of a clause in a coalition deal with the SPD that envisages a review of the next government’s progress after two years to assess whether any changes to its mission are needed. Kramp-Karrenbauer is expected to be voted into her new role at a Feb. 26 party congress. Her promotion is a setback to Jens Spahn, a 37-year-old arch-conservative long seen as a rising star in the CDU with an eye on the succession. Outgoing secretary general Peter Tauber is giving up the role after a period of illness. Sometimes dubbed “mini Merkel” by German media, Kramp-Karrenbauer is highly regarded in her party for winning an election in her region last year that buoyed the CDU’s national standing ahead of the 24 September federal vote. By taking on the secretary general role, she will build up her network in the CDU, something she has had only limited ability to do as premier of Saarland, a state of just 1 million people that borders France. Merkel will remain CDU chairwoman. Nearly five months after the national election, Germany is still without a federal government as the SPD consults its members before embarking on a re-run of their ‘grand coalition’ with Merkel’s conservative bloc. The election saw the AfD win seats in parliament for the first time – a political earthquake that followed Merkel’s 2015 decision to leave open German borders to more than 1 million migrants. Kramp-Karrenbauer commands respect in the party for her serious, factual approach to policymaking. She impressed Merkel last month when, after a car crash, she continued work on coalition negotiations from her hospital bed.